I received an e-mail from one of the girls who submitted photos for the Favorite Photo feature. She was a little anxious wondering when her photo would appear here. I am posting the photos in the order I received them. There are currently 13 girls in queue. This year on average I have posted 2.3 photos per week. Doing the math… at that rate, if you submitted your favorite photo (and the story behind it) to me today, they would appear here in six weeks. Speaking of doing the math, there is a difference of opinion on the number of hits this blog has taken. StatCounter's "page loads" counter (displayed near the bottom of this blog's sidebar) is in the neighborhood of 9.9 million hits, while Google's "pageview" counter is in the neighborhood of 10.1 million. Go figure! Google statistics indicate that most of the hits come from the USA, followed by the UK, Canada, Germany, India, Australia, France, Spain, Sweden and Russia. I'm a little surprised to see Germany in the midst of the English-speaking countries. I was very surprised that Android was the second most popular operating system used to read this blog. Windows was first and Macintosh was third, followed by iPhone, iPad and Linux. Back to the main topic of this blog, this girl will be femulating on the UCONN campus a week from today attending and presenting at the True Color Conference. "Crossdressing Successfully in the Real World" is the title of my 75-minute presentation. Its purpose is to teach and encourage male-to-female crossdressers to escape from fantasyland and experience the real world as females. Last year, I was thrilled that my presentation attracted 40 middle school, high school, and college students as well as a handful of adults (parents and educators). There were a lot of good questions and exchanges; I noticed some people taking notes and most of the post-presentation evaluations rated me Above Average or Excellent. I hope it goes as well next week. Thank-you, Bill. I'm glad I can help in any way! You do many good things for the community but I would have to rank your presentation at True Colors near the top of the list. Thanks on behalf of all the young folks you may help. This Sunday's project is to update my workshop for the True Colors conference. There will be no COS table this year. You find Germany at this position because there is no comparable blog which offers in such an interesting and such a lively manner all sorts of informations, experiences and thoughts about girls like us. 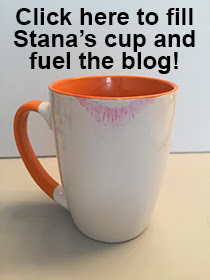 Your blog is fab, you are fab, Stana.